Please welcome the 7 cubic foot Compost Wizard Jr. This little guy is the scaled down version of its 12 cubic foot kin. The Jr. holds 7 cubic feet of compost and sits on a wheeled base. The handles now provide better grip to make turning even easier. The 12-inch twist off lid keeps your compost safely closed off but is easy to remove and even doubles as an extra turning point. The ends feature aeration holes which provide much needed airflow for the compost batch with the option of drilling more for those who live in areas with low air currents. The wheeled base allows owners to turn the bin effortlessly and can easily be separated to allow the bin to roll freely from place to place. The low profile ensures that it stays out of sight and won't be blown over in high winds like other tumbler composters. 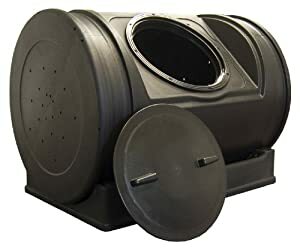 The resin material used to mold the bin is 100% recycled and the rich dark color absorbs the sun's heat keeping your compost at a nice hot temperature. Comes fully assembled and requires little maintenance. Just turn once a week and after addition of new material and you can see compost in as little as 14 days. Help keep organic waste out of our landfills by getting a Compost Wizard Jr. today.